Do you own a restaurant, a café or a bar? Then Stir Stick Straws are something you definitely need in large amounts. These Stirring Sippers come in packs of 1000 and 2000. They also come in two sizes, 5 inches and 7.5 inches long. But apart from businesses, you can use the Straws to have your coffee and drinks at home or when you are organizing big cocktail parties. Do you wish to use the Stir Stick in a mug, a cup, a tumbler glass or maybe in a martini stemmed glass? Is your favorite drink a cocktail, a soft drink, a juice, an iced coffee, a smoothie or an iced tea? Maybe it is a hot chocolate or a hot coffee. No matter the size and shape of your glass and the type of your drink, the Stirring Sippers will help you sip it and stir it thoroughly. You can do 3 different things with these Sipping Stir Sticks. You can sip your drink, mix your drink or add them as a decoration in your glass. 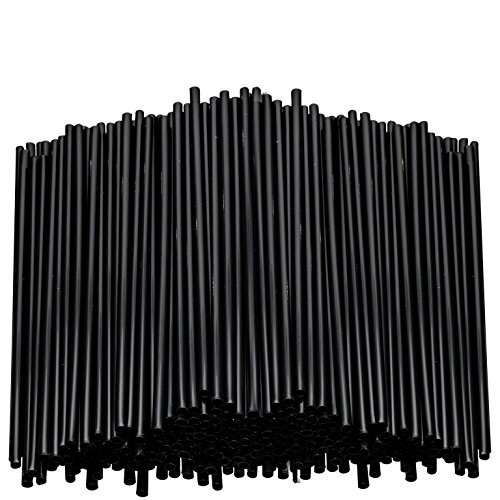 The Stirring Straws come in the most classy and classic color, black. No matter the style of your business, the Sippers will fit right in. They also have the most elegant design. The Sipping Stir Sticks are slim and straight and they will look great even in the most elegant glasses. The Stirring Sippers are made with plastic. It is thin yet strong and it can mix both hot and cold beverages. The plastic is BPA free and FDA approved. It is, therefore, completely and undeniably safe to use. And, of course, the Straws are recyclable. Simply rinse them after you use them and throw them in the special bins! Don't Miss Out! Add The Straw Stirrers To Your Cart NOW! PICK THE SIZE YOU PREFER: The Stirring Straws come in two different sizes. One is 5 inches and the other is 7.5 inches long. You can order the size you prefer, based on the glass of the drink that you wish to use them for. You can also choose how many Stirring Sippers you want to receive. The options are again two; you can either get a pack of 1000 or 2000. So what's it gonna be? FOR YOUR BUSINESS OR YOUR HOUSE: These Stirring Sticks are perfect for your business. If you own a restaurant, a coffee shop, a juice bar, a smoothie café, a pizza place or a frozen yogurt store, then these Sippers will definitely come in handy. But you can also get a box of Sipping Stirrers for personal use. They are disposable and you can use them to drink your coffee or juice at home. STIR BOTH HOT AND COLD DRINKS: Whether you want to stir a cold beverage or a hot one, in both cases you can use these Stir Sticks. They will help you incorporate all of the ingredients in your drink to keep it tasty and smooth. The material of the Stirring Sippers is strong enough to stand both high and low temperatures, although we do recommend that you don't use it if your drink is boiling hot. MADE FROM SAFE PLASTIC: The Stirring Sticks are made with plastic. Their plastic is BPA free and it has, therefore, been FDA approved. Your health will not be at risk if you use these food safe Stirring Sippers. So use them to stir your hot and cold beverages and don't worry about anything. The Stir Sticks are practical, strong, multipurpose and 100% safe. If you have any questions about this product by eDayDeal, contact us by completing and submitting the form below. If you are looking for a specif part number, please include it with your message.